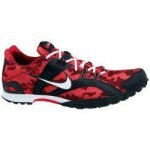 Below is an article on the use of running spikes and how to choose them. We hope you find it useful. You'll find all the spikes you'll need at ActivInstinct.com. The answer to this is quite simple - running spikes allow you to run faster! The extra grip that the small metal or ceramic spikes give you help you avoid slipping so more of your force can be in a forwards direction. In addition to this spikes are lighter than trainers and the various types are designed to help your foot placement be as ideal as possible for your chosen event. Running Spikes are essentially just running shoes with a series of threads on the base of them into which are screwed "spikes" that are small metallic or ceramic objects with a thread that goes into the shoe. They can be sharp or studs or even in a christmas tree shape. The first running spike was invented by Joseph William Foster in the 1890s and developed to a great extent by Adolf Dassler who set up the Adidas company. Sprint Spikes are for sprinters. Okay - that's enough of the blindingly obvious! 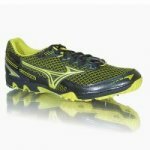 They are the lightest spikes on the market, generally with no padding in the heels at all. They are also relatively stiff with the spike plate on the bottom (under the toes) built in a way that forces the runner to run on their toes. Sprint running spikes are useful for athletes running at high speed - so good 400m runners can make use of them too (we'd generally advise that if you are quicker than about 52 seconds over 400m this would be a reasonable thing to do). Some top class 800m runners also run in sprint spikes - with Maria Mutola being a famous example - although this isn't necessarily something that we would recommend. Still very light, but generally with a bit of cushionning in the heel. For use at slower speeds than sprint spikes, but still where a majority of the running is to be done on the forefoot as the spike plate still forces this kind of running action. Generally, the sole on middle distance spikes is less rigid than a sprint spike and as such is less demanding on the athletes running posture. 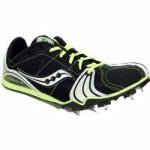 These have much more cushionning that the other track spikes and are generally flatter. They are also a bit heavier than other track spikes, but still significantly lighter than running trainers. If you are running at speeds slower than about 18-20seconds for each 100m in your races, we would suggest these will supply the cushioning you need for your races. The biggest subset of spikes we have missed off so far are the off-track spikes, usually called cross-country spikes. They are much sturdier than other spikes and have much better grip on them - often including on the sides of the sole as well as the base. Many runners also use these on tracks for their slower training (where normal running shoes would be too heavy) as they provide more support and cushioning for the foot. 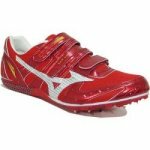 The major manufacturers of running spikes include Asics, Nike, Adidas, Reebok, Brooks, Mizuno, Saucony and Puma amongst others. Pyramid Spike. These are the most common type of spike and a basically a wide base going to a point. Stud. Have a blunt end, like a football stud, but still get decent grip on the track. Xmas Tree Spike. These have ridges going around them which get grip in a number of directions if your footstrike isn't always the same - good for hurdlers. So, now you know all about what to look for in your spikes, it is time to choose some. We have a list of some of our favourite spikes here.